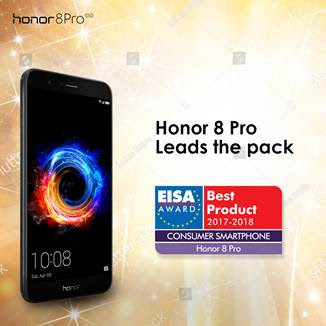 Honor, a global leading smartphone e-brand which continues to ride its wave of success and market recognition, has just received a major accolade from the European Imaging and Sound Association (EISA) which bestowed on Honor 8 Pro, the prestigious and highly coveted ‘EISA Consumer Smartphone 2017 – 2018’ Award. EISA called out the Honor 8 Pro as “a fitting tribute to the innovative engineering and great performance from Honor”. Owing to its best in class technology innovation, seamless performance and elegant form factor, the Honor 8 Pro has emerged as the smartphone of choice among discerning customers in the Indian market. Within just 54 hours of the Amazon Prime Day in India, Honor 8 Pro reached sales of 2,000 units, earning the ranking of best-selling smartphone in the Rs 25,000 to Rs 30,000 price band. Globally, the Honor 8 Pro has attracted and amazed fans from around the globe, including Malaysia, India, Russia, Germany, France, Italy, the United Kingdom, Czech Republic, Poland, Sweden, Finland, and Norway. Honor continues to innovate and develop millennial centric devices that meet the needs of next-generation smartphone users and gamers around the world.